Today's job was to take in the sides of 3 thermal shirts for a gentleman. In order to accommodate his long arms, he has to buy shirts that are too big in the body. This larger size does give him the length he wants, though. Below you see me taking in 4" on each side of the shirt. That's right, a total of 8" is coming off the torso. 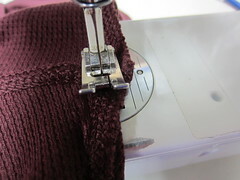 I started at the hemline, making sure the top and bottom of the shirt are perfectly aligned. I had made a small chalk mark here, which is not visible from this camera angle. It is 2" from the existing stitching. I know I want my needle to end up where the sleeve meets the side seam, so I am just picturing a diagonal line going from hem to armhole. If you are more comfortable using pins or chalk to mark your line, feel free. My needle meets the armhole stitching. 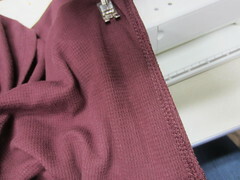 On thermal knits, as well as other sportswear, the seam is a flatfell seam. 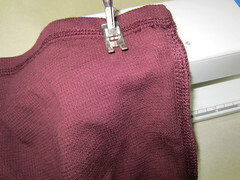 It is constructed by a machine that leaves no seam allowance on the inside of the fabric. I have to blend my stitches into this area. The underarm will hide any slight imperfections. Another view of the armhole area. 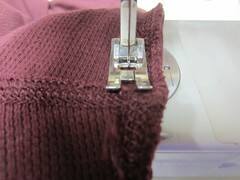 I have tapered my stitching into the sleeve just a bit to give it a smooth transition. Then I'll serge the edges. I won't get any money from this client. It's ok, though. My son pays me with a smile and a hug and that's worth more than the green stuff any day!